Local and world news is peppered with tales of aggression, violence and corruption. It’s good to see positive stories of hope and peace. Kim Jong-un’s crossing of the North and South Korean border is one of them. Optimistically, it is a precursor to the end of years of disunity and antagonism. It is eerie to see Kim Jong-un and Moon Jae-in walking across a path that one year ago heralded gun fire. I remember visiting the DMZ in 2016 and I recognize every angle of this video’s background. The place struck me then as a surreal setting for a Twilight Zone scene. I am hopeful now for a Disney HEA. Photo taken in South Korea, 2016. Quick. When you see this picture what do you think? Actually, the Koreans are no more phobic about sun exposure than the Japanese, Chinese or Singaporeans. In fact most Asian women seem abnormally preoccupied in keeping their skin pale and blemish free. In Singapore on really sunny days (that would be 9 out of 10 days) I am routinely sideswiped by exploding umbrellas at crowded street corners. On busy and not so busy sidewalks, it’s challenging to dodge slow moving people with unfurled umbrellas. 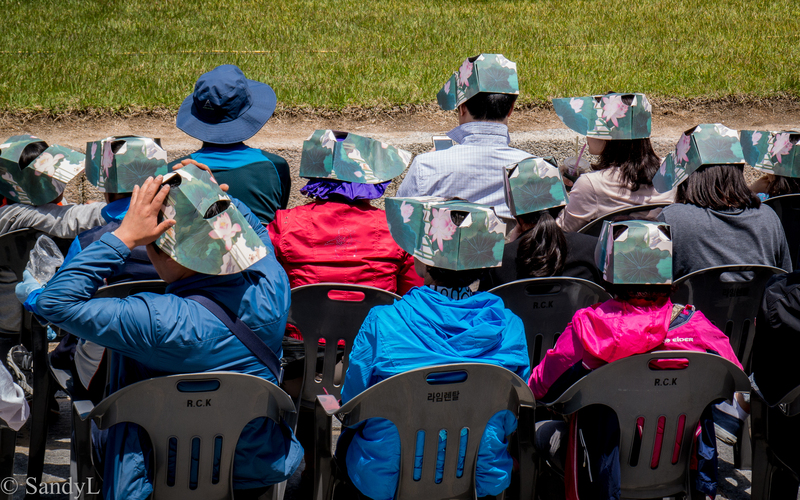 At times like these I appreciate the merits of another distinctively Asian head wear – the full-face, paisley piped, sun eclipsing visor cap. 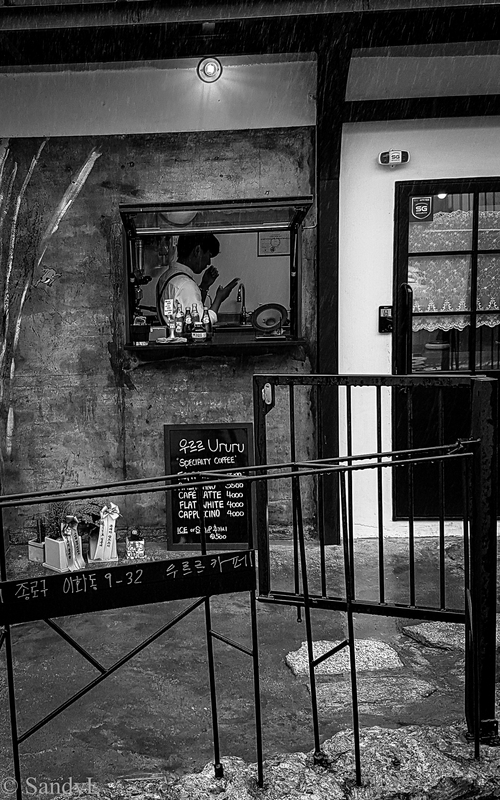 In the north east corner of Seoul, beside the old city wall on Naksan mountain there’s a quaint little village called Ihwa. In the Josean era this area used to be grand, a fortress locality for the new capital. But the times peaked and declined and by the end of the Korean War it was a derelict shanty town. In 2006 the Ministry of Culture & Tourism established the Naksan Art Project, an initiative to re-invent urban areas into arts and culture friendly environments. Ihwa was selected for revitalization by painted murals and art installations. The Ihwa Mural Village is a popular but not so well known tourist spot. On TripAdvisor it is #53 of Things to Do and it is not even mentioned in my Lonely Planets Korea guidebook. I forget how I’d stumbled across it. Maybe I did a search on “quirky Seoul” or “alternative sites that are not castles, palaces and museums.” Suffice to say I found it and on a dark and overcast morning, I headed out to Hyehwa Stn on Line 4. The village is tucked in high on the mountain side. My Google search hadn’t quite prepared me for the climb nor for the unmarked route through a clubbing district, up a hair pin road and around a sprawling hilltop park. The rain had degraded into a drizzle and cloudy skies obscured scenic views of the city. On a sunnier day the mural village would have provided cheery photo ops. I had one. But mostly my pictures were somber, black and white super-impositions of life and art. Life is not always cheery. Sometimes we have to stand in the rain and look in to the window of someone else’s warmth. Across Seoul’s ancient Heunginjimum Gate lies the Dongdaemun Shopping Complex and entrance to one of the busiest textile districts in Asia. 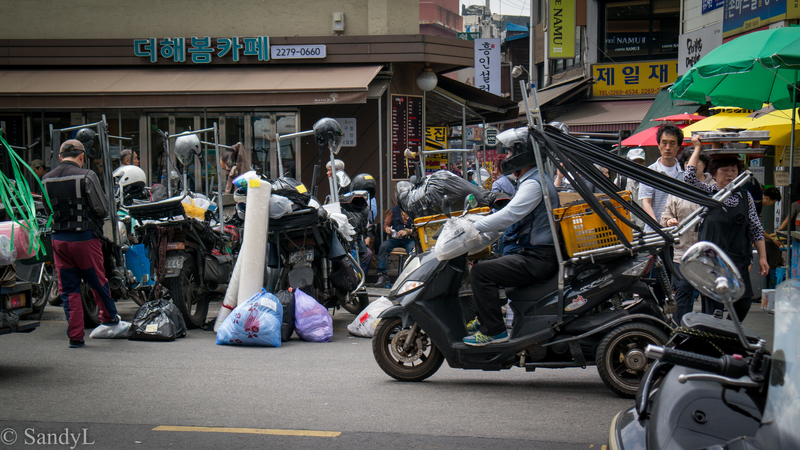 This is a busy but orderly intersection with cars, minivans and motor bikes turning right into downtown Seoul or heading left, out of the city core. When the traffic light changes a huddle of well dressed pedestrians surge across the street. A lone chige porter runs through the crowd, his stride quick and nimble with an empty wooden A-frame balanced lightly on his shoulders. Further away, in the core of the textile market, the traffic composition changes. In this neighborhood of wholesalers and resellers, the roads are congested with people and automobiles delivering and unloading goods. The warren of narrow alleys are blocked to large vehicles. Instead they stop at the boundaries where porters load bales of cloth and packages onto their A-frame carriers. 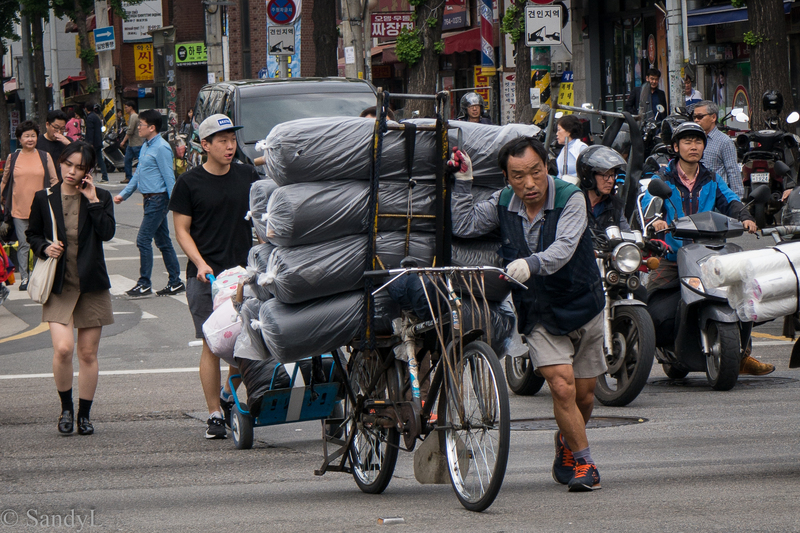 Three wheeled and bi-pedaled porters throng the streets and it’s an artful dance to avoid collision on the packed sidewalks. I am fascinated by the chige carriers. Made of wood and rope, the sturdy A-frame back carriers were originally used by Korean farmers and field workers. It was designed to hang the weight of the load on the shoulders while the center of gravity was low in the back. This allowed the bearer to carry heavy loads while walking, even on a steep gradient. During the Korean war, the carrier was quickly adopted by the United Nations troops. The Americans called them A-frames, the British called them ‘jiggies.’ Backpackers will recognize the origins of modern day aluminum frames used to hoist camping, hunting and baby gear all over the world. It is early afternoon, late in a day that started in midnight morning. Dongdaemun is busiest at night during the after-hours of day-time business, when buyers converge on the district to purchase supplies. It makes sense that food vendors dash by, delivering dinner on heavily laden trays balanced on their heads. They move with apparent sonar vision, eyes cast down, deftly avoiding stationary and moving obstacles. I love the busyness of the market, the earnest vitality of hard working people going about their lives. There’s nothing artificial here. Nothing reconstructed, recreated or re-enacted. It’s a working market with a thrum of energy that’s as real as the sound of traffic, the heat of the crowds and the brush of pedestrians passing you by. When visiting a new place it’s good to have no expectations. If it’s my turn to organize, I’ll make a vague plan for each day. One destination only. Flexible and changeable in case of rain or whimsy. Every day becomes a surprise. My camera and I walk around capturing moments and scenes. Here’s a few.